Nicholas Schaffner wrote this book in 1977, and I gather from what I’m reading on the web that it was, in it’s time, something of a Beatles “bible” for readers back then. So far this book has eluded me – so its good to have an original paperback copy now in the collection. 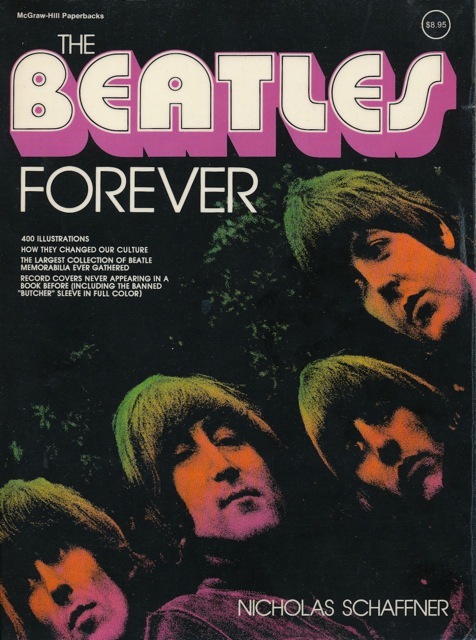 “The Beatles Forever” has subsequently been reprinted numerous times and the current cover looks like this. But the copy I found last weekend in an old-wares/antiques/records and second-hand book shop has the original cover above. This is a paperback copy. 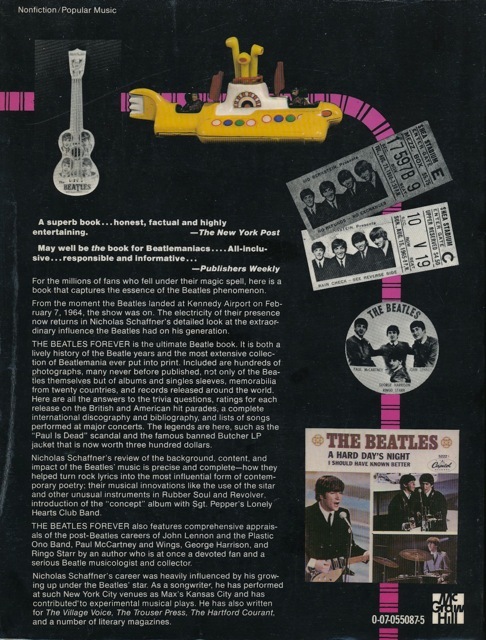 It is genuinely one of the first really comprehensive survey’s of the band’s output in terms of their record releases, rarities and memorabilia – all accompanied by fairly detailed text describing the history of the Beatles and giving the context in which records were released and the collectable nature of a wide range of Beatles items. There are extensive photographs of the band as well as photos of albums, singles and memorabilia – but all in black and white. I won’t go into a detailed analysis of the contents because this has already been done by a range of writers who have reviewed and critiqued “The Beatles Forever”. Probably the most comprehensive is by Donald Sauter – who has written extensively on his Beatles collection and reminiscences from his youth. His article also contains a small selection of the many photos from the book. There is another interesting page on the book here. Its a handy reference book to have in the collection – even though it came out more than 30 years ago. It still has lots of information and insights. This entry was posted in Beatles, Beatles Books, Beatles Collecting, Beatles Music, George Harrison, John Lennon, Paul McCartney, Ringo Starr and tagged Beatles, Beatles Books, Beatles Collecting, Beatles Related, George Harrison, John Lennon, Music, Paul McCartney, Ringo Starr by beatlesblogger. Bookmark the permalink. Yes, this was the must-have Beatle book for us in the US back in the late 70s. What’s amazing is how much of Schaffner’s information is accurate, as opposed to being debunked by later research. It’s a shame he didn’t live to ever update it; I always wonder what he’d’ve thought of the later solo material and such. Hi, Thanks Wardo. And I’ve just checked out your blog http://everybodysdummy.blogspot.com/ – really great stuff. We have quite similar tastes. (Joni, Bob, Ben Folds, Peter Gabriel, Neil, U2, Pink Floyd, The Monkees, and of course Lennon and McCartney). Having been born in 1965, my exposure to The Beatles prior to this book consisted of (a) my older brother’s copy of the Australian ‘Penny Lane’ EP (now mine), (b) the re-runs of the cartoon series on children’s television in the mornings in the early 70s and (c) every Beatles LP I had managed to get my hands on via birthdays, Christmas and saved pocket money between 1976 and 1979. There’s a long story associated with me acquiring my copy of this book while on holiday back in January 1979, but suffice it to say, it absolutely blew my mind with the information it contained. To this day, I still find myself referring back to it when I read any of the plethora of subsequent books on the Beatles and think to myself “hey – that’s not right!”. I think it has the distinct advantage of having been written and researched at a time when the echoes of the Beatles were still within earshot, and without the natural human biases that have arisen since December 1980. For the same reason, it also has an underlying feeling that maybe – just maybe – it might be possible that the boys might one day get back together. Really nice comments – thanks Michael. You really put the book into perspective and make it personal.